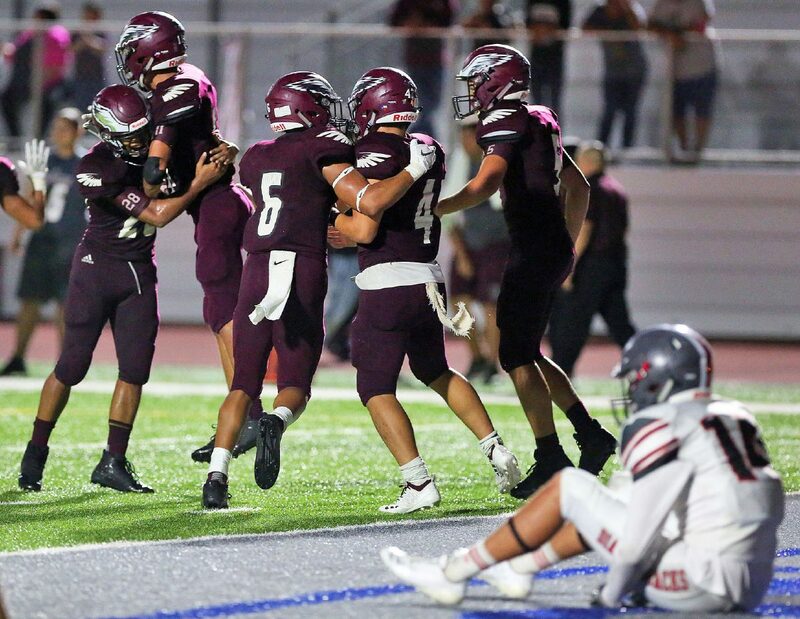 Mission High defensive line celebrates after a missed reception by Sharyland Pioneer wide receiver Luke Padilla (14) in the endzone in the final seconds of the fourth quarter in a non-district game at Tom Landry Stadium on Thursday, Sept. 13, 2018, in Mission. The wait is over. District 30-6A football starts with a bang after a leaguewide bye week. 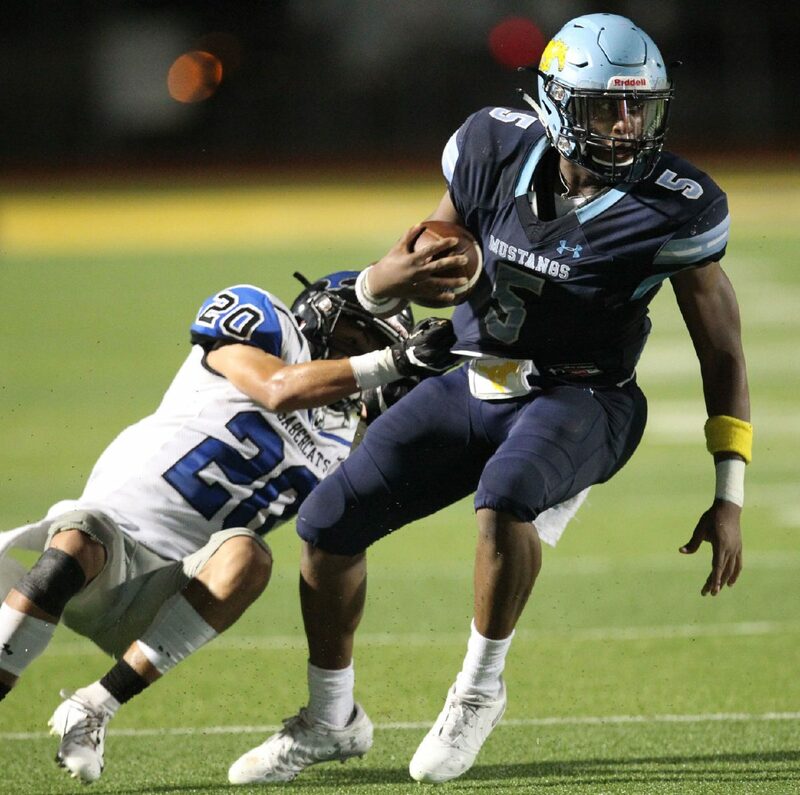 The four-game schedule has plenty of great matchups, but the granddaddy is four-time district champions McAllen Memorial hosting upstart and undefeated Mission High. Mission High won all three of its non-district games, starting with a Week 1 upset win over Mission Veterans. Mission’s stock rose with that victory. The Eagles also won a close game against Sharyland Pioneer and let their offense go wild against Donna North, dropping 56 points. McAllen Memorial Campbell Speights drags a Vela defender Ivan Mendoza during the first quarter at McAllen Veterans Memorial Stadium on Friday, Sept.14, 2018, in McAllen. Singling out just one offensive leader is tough for the Eagles. Two quarterbacks, returner Damian Gomez and freshman Jeremy Duran, have both seen action and impressed. Gomez is 16 for 23 with two interceptions and two scores, while Duran is 17 for 20 with three touchdowns against one pick. Horacio Moronta is the primary running back with 343 yards and four TDs on 47 carries. While Mission looks promising, Memorial has brand value. Sure, the Mustangs enter with a 1-2 record, but their losses came to tough opposition. Memorial dropped games to Brownsville Hanna and Edinburg Vela — two teams that have remained in the RGVSports.com top five all season. Hanna sits third, while Vela holds pat as the Valley’s No. 1 team. Memorial’s defense will need to step up. The group has allowed 411 yards per game through three games. Still, the Mustangs haven’t lost a district game in four seasons. Until further notice, the Mustangs stay the team to beat in District 30-6A. Thursday is the first chance for a challenger to step into the ring. Campbell Speights is still the most dangerous runner in the Valley. The junior has 429 yards and five touchdowns so far. He averages 7.4 yards per carry thanks to his ability to break runs of 60-plus yards with even the smallest space to run through. Quarterback Sean Skaugen has 278 yards and three scores on the ground. Thursday will answer some key questions about the district: Is No. 9 McAllen Memorial being overlooked because of non-district losses to strong opponents? And is No. 6 Mission High the best chance to end the Mustangs’ reign as 30-6A juggernauts?